We hope you have a happy Thanksgiving. 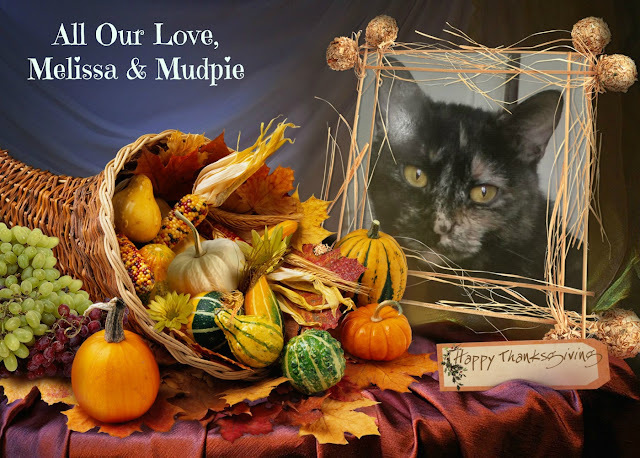 Happy Thanksgiving to both of you from Allegra, Ruby and me! Happy Thanksgiving! I am thankful for your friendship. Happy Thanksgiving, Mudpie and Melissa! We hope you have a wonderful day full of family, friendship, fun, and feasting! Happy Thanksgiving. Have a wonderful day filled with memories and joy. Happy Thanksgiving to all! Remember to gobble till you wobble. Heh! We're thankful for your friendship. Happy Thanksgiving! Enjoy your beef! Wishing you a wonderful Thanksgiving from all of us! Happy Thanksgiving (aka Ham Day)! Mes wishing Joy, Happiness and Health and MORE for your Thanksgiving!